Perfect for a comparative anatomy course, as well as a course focusing on mammalian anatomy and physiology, this collection contains an entire pig specimen for dissection and larger sheep organs for a closer look at their structures and functions. 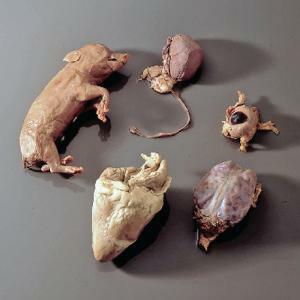 Contents: 6–8" pig embryo, sheep brain, sheep eye, sheep heart, and sheep kidney all supplied in a pail. Set of five.